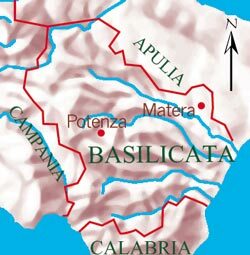 Historically one of Italy's poorest regions, Basilicata is also one of its least populated: high, craggy mountains and intractable soil have made agriculture a difficult proposition, and many Lucani (as the people of Basilicata are called) emigrated for luckier lands in the 1900s. Today, the economic situation is much improved, but the cuisine of Basilicata remains a rural one, deeply anchored in peasant traditions. 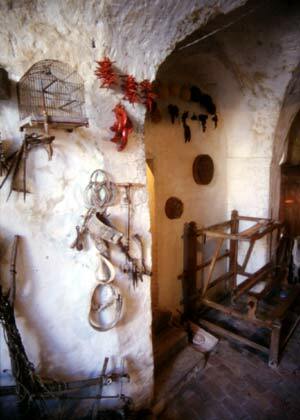 Matera, known as "The City of Stone," is one of only two cities in the region with over 50,000 inhabitants. 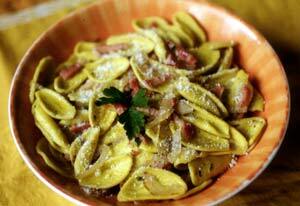 This is a classic Sunday dinner dish in Potenza, Basilicata's capital. In a bowl, mix the ground beef and pork together with the garlic, egg, bread crumbs, milk, parsley, ¼ teaspoon of the salt, ¼ teaspoon of the pepper, and the chili flakes. Mash vigorously with your hands until smooth, about 3 minutes. Shape the mixture into small balls. Heat the olive oil in a pan large enough to accommodate the pasta later; add the meatballs, and when they have browned evenly, after about 10 minutes, add the tomatoes. Season with ¼ teaspoon of the salt and the remaining ¼ teaspoon of pepper. Simmer for 15 minutes. 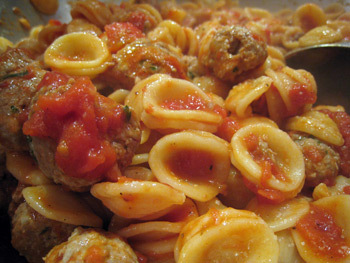 Cook the orecchiette in 4 quarts of boiling water with the remaining 2 tablespoons of salt until al dente; drain, reserving 1 cup of the cooking water if needed to dilute the sauce, and fold into the pan with the meatballs. Cook for 2 minutes, or until the pasta has absorbed some of the sauce, adding some reserved cooking water if needed. We first tasted this dish at Ristorante Casino del Diavolo in Matera, where chef-owner Franco Ritella cooks amazingly flavorful local specialties. Place the bread crumbs in a skillet over medium heat and cook 3 minutes, stirring, or until they are golden and aromatic; transfer to a plate. In the same skillet, heat the olive oil with the anchovy fillets, garlic, and chili pepper until the anchovies break down and the garlic is aromatic, about 2 minutes; do not allow the garlic to burn or it will be bitter. Remove from the heat. Meanwhile, bring 6 quarts of water to a boil. Add the cavatelli and salt, drop in the broccoli raab, and stir. Bring back to a boil and cook until the cavatelli are al dente, about 10 minutes; drain and reserve 1 cup of the pasta cooking water. A hearty, peasant soup that makes the most of midsummer's bounty. You can add zucchini or fava beans, fresh peas, whatever beckons at the market. Bring 1 quart of water to a boil. 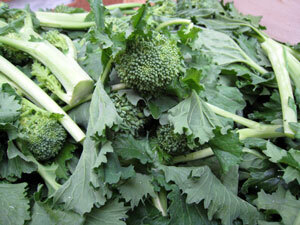 Add 1 tablespoon of the salt and the broccoli raab. Cook until tender, about 15 minutes. Drain, cool under running water to stop the cooking and set the color, and set aside. Place 2 cups of water, the olive oil, carrot, potatoes, tomatoes, onion, bay leaf, and remaining ½ teaspoon of salt in a medium pot. Set over medium heat and bring to a boil. Cook, uncovered, until the potatoes are tender, about 15 minutes. Discard the bay leaf. Place the bread in a soup tureen. Add the eggs and the broccoli raab. 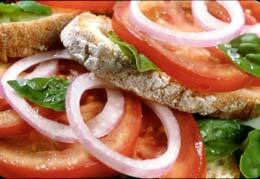 Please don’t attempt to make this delicious finger food unless your tomatoes are bursting with flavor. Called acqua e sale (“water and salt”) in Basilicata, this humble bruschetta is what many farmers ate in the fields--but it also makes an excellent finger food at parties with a glass of crisp white wine. This hearty savory pie can be served as an appetizer or as a main course, and is best freshly baked, while still hot. 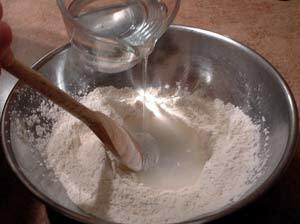 Make the dough: Place the flour, yeast, 1 teaspoon of the salt, and the sugar in a food processor. Pulse to combine. Add ½ cup of warm (110°) water with the motor running, then add 1 teaspoon of the olive oil and the egg yolk. Process 45 seconds, adding a little water if the dough is dry or a little flour if it is sticky. Shape into a ball, place in an oiled bowl, cover, and let rise at room temperature until doubled, about 1½ hours. Meanwhile, make the filling: Bring 2 quarts of water to a boil. Drop in the arugula and cook 1 minute; remove with a slotted spoon to a bowl of ice water, then drain, squeeze dry, and chop. Add the fennel to the boiling water; cook 2 minutes, then drain, rinse under cool water, and drain again. Heat the olive oil in a 12-inch skillet. Add the sausage; cook 5 minutes over medium heat, stirring often; the sausage should be cooked all the way through. Cook longer if it is not. Add the garlic and cook 1 more minute. Transfer to a bowl, cool to room temperature, and fold in the arugula, fennel, basil, salt, pepper, and Pecorino. Grease a 12-inch pizza pan. 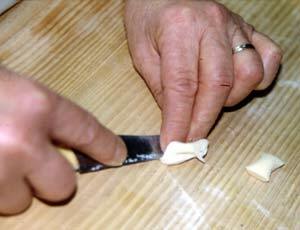 Cut the risen dough into 2 pieces, one slightly larger than the other. Roll out the larger piece into a 14-inch circle on a lightly floured counter. Line the pan with it, letting the excess dough hang over the sides. This hearty soup is perfect on fall and winter evenings. 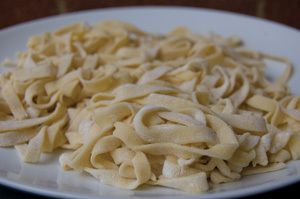 In Basilicata, the tagliatelle are made with just semolina and hot water, rolled out thicker than in the center and north of Italy, and often cut into short strips called lagane. You can cook the chickpea soup base up to 3 days ahead and refrigerate it, or freeze it up to 1 month. Return it to a boil and add the pasta minutes before you are ready to serve. Be sure to drizzle a bit of raw olive oil over the finished dish just before serving for maximum intensity. Place all but 1/4 cup of the chickpeas in a food processor. Pulse to purée. Add 1 tablespoon of the olive oil, 4 cups of water, the garlic, cayenne, parsley, and salt, and process to a smooth paste. Transfer to a large pot and add the reserved whole chickpeas, basil, and tomatoes. Set over medium heat and cook 30 minutes, stirring once in a while. Add more water if the liquid reduces too much; the consistency should be loose and soupy. 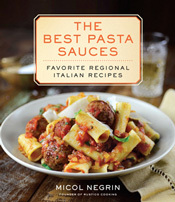 Bring the liquid to a boil over medium-high heat and add the pasta. 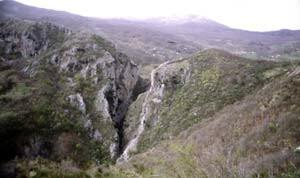 Historically one of Italy's poorest regions, Basilicata is also one of its least populated: high, craggy mountains and intractable soil have made agriculture a difficult proposition, and many Lucani (as the people of Basilicata are called) emigrated for luckier lands in the 1900s. Today, the economic situation is much improved, but the cuisine of Basilicata remains a rural one, deeply anchored in peasant traditions. 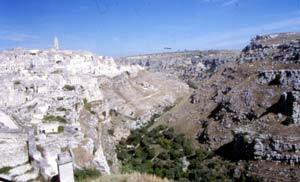 Matera (left), known as "The City of Stone," is one of only two cities in the region with over 50,000 inhabitants. Matera is a maze of white stone... Its homes are dug in the soft tufaceous stone of a mountain, and the floor of one home serves as the ceiling of the one beneath it. 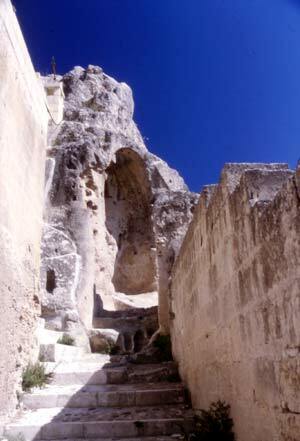 Matera's churches are also dug in the mountain face. 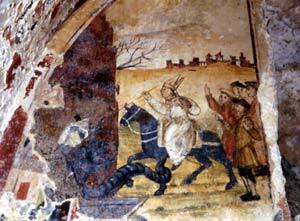 In the dimly lit interior, you can see colorful wall paintings. 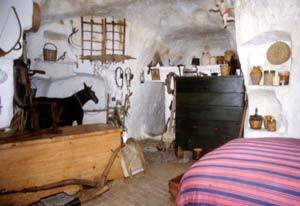 Until the 1950s in the City of Stone, people lived in grotto homes, often with their farm animals (see the horse in the corner?). Until the 1950s, there was no electricity and no running water in the grotto, and many people lived in dismal conditions. 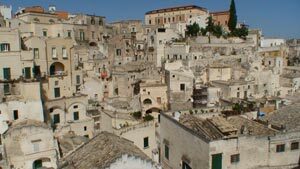 When the Italian government modernized the homes, Matera became a thriving city and a must-see on a tour of Basilicata. The western coast of Basilicata is known for its breathtaking views, and exclusive resorts perched on the sea. 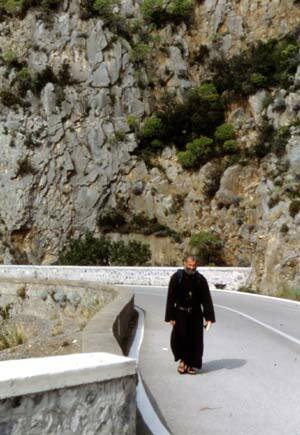 A solitary monk spotted along the road is not an unusual sight in this pristine corner of Italy. 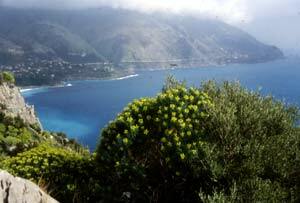 The drive up to the city of Maratea is almost surreal, and a dense fog often descends on the tranquil hills. 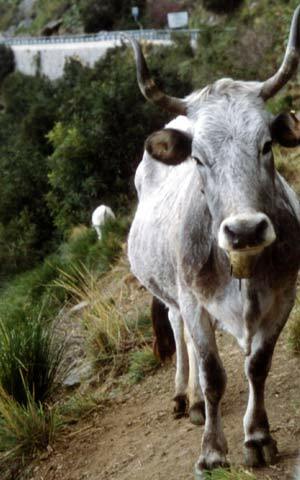 Around a bend in the road, you might come face to face with a cow grazing on mountain herbs. 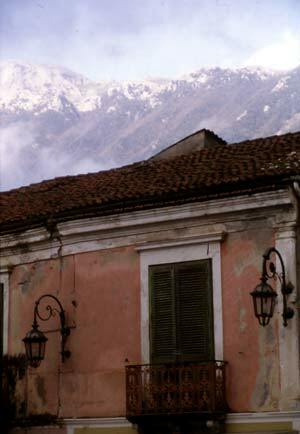 The town of Maratea sits below a dramatic backdrop of snow-capped mountains even in the summer months. 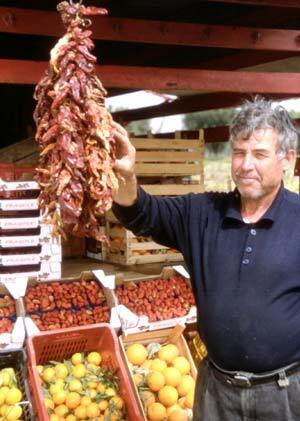 Basilicata's cuisine is laced with various chilies--some spicy, and some sweet. Here, hot peppers are proudly displayed in the back of a truck near Metaponto, Basilicata's agricultural nerve center. 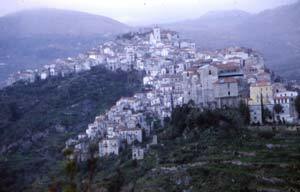 The small hilltop town of Rivello--known for its watchmakers--rises mysteriously on the horizon above Lagonegro. 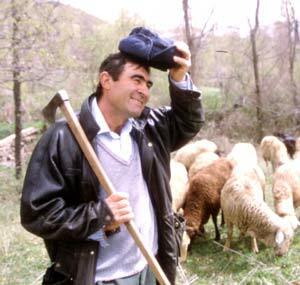 Antonio the shepherd tends his flock in the Pollino mountains, where farmers have to face a difficult climate and preserve vegetables for the cold winter months. 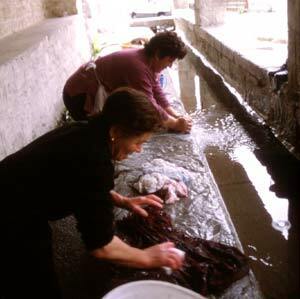 In Terranova di Pollino, a traditional mountain community of 1,600 people, the women still head to the outdoor washing trough to do the laundry. Sharing recipes and trading gossip makes the time pass quickly. 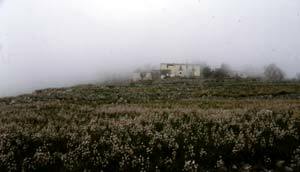 The rugged Pollino mountains, though difficult to traverse, yield succulent mushrooms, wild asparagus, and more for country feasts. 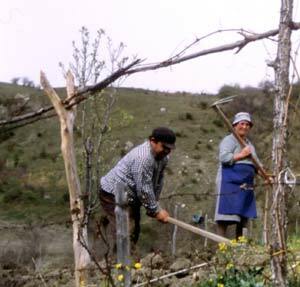 Farmers in the Pollino still work the fields the old-fashioned way. The land is difficult to cultivate, because it is steep and arid, and wheat is one of the kitchen staples. 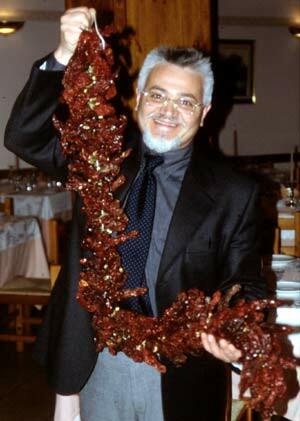 Giuseppe Golia--Pino to friends--owns a charming restaurant and hotel in Terranova di Pollino, Hotel Ristorante Picchio Nero, where the famous hot peppers of Senise and other local specialties mingle to create a hearty regional cuisine. 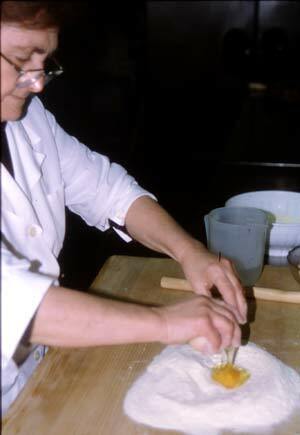 Pino's mother, Melina, begins each day by kneading and rolling out pasta dough--some made of soft wheat flour and egg, some made only of semonlina flour and water, and yet another with a combination of flours called miskiglio. 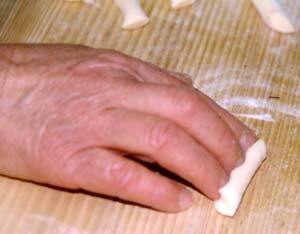 Here, Melina uses four fingers to create indentations in homemade cavatelli. 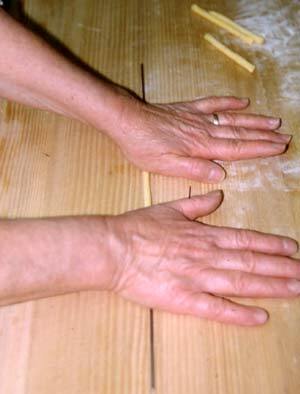 Another typical pasta in Basilicata is made by rolling thin logs of dough around an iron rod, creating thick, hollow spaghetti that must be shaped one at a time. Melina also shapes classic cavatelli: she presses a knife into the center of pea-sized pieces of dough, creating an indented pasta that catches chunky sauces beautifully. Harking back to days when wheat flour was scarce in Basilicata, Melina prepares a special pasta using fava bean, barley, chickpea, and semolina flours. The shape is similar to teardrops or slivered almonds.